A quick update for you, after the first night of ny quil on Saturday night, I woke up feeling much better yesterday morning! I’m still a lil sick (and my nose is still red and dry) but I’m def feeling a lot better. Yesterday I was going to blog, but hit a lil bit of writer’s block, as well as I had a lot of nervous, excited energy. My good friend is very deep (otherwise known as doing very well) in the biggest poker event of the year, which I happen to be interning at (once it’s over I plan a whole blog post on what I’ve been doing), so I decided to go to work early to watch him play, which led to no blog post yesterday. During a break yesterday I headed to a fro yo (frozen yogurt) place. It’s at a pretty crowded outdoor mall area, and there was a decent size line. As I’m in line I begin to start watching people and I see that the reason the line is so long is that people get weird about people going in front of them instead of waiting for that person to move along. Like person in front of me stopped for a fro yo flavor at the beginning of the line, while I wanted the flavor that was further down. But as I moved forward the other person jumped back in front of me, blocking the way. So what is proper fro yo etiquette? It’s self serve, I feel I should be able to go to whatever one I want, as long as I’m not knocking anyone out of the way, or jumping in front of a person who is waiting for that flavor. So after waiting 5 minutes just to get to the strawberry flavor because this woman was adamant I not get in front of her, I then get to the toppings area. Now I can’t reach any of the toppings because the woman in front of me, refuses to stand closer than a foot from the people in front of her. The topping area is maybe 6 feet long, so my fro yo is melting and I can’t get to the toppings. But with cheesecake bites and a lil bit of red velvet cake batter mixed in. On a side note, I also got the great news that my parents will be visiting me in 10 days! They were going to surprise me (and had been plotting with ff5) but when they realized I might not finish my school work in time, they decided to tell me so I would get my paper done. Can’t wait to share all the touristy stuff we do while they’re here, they have only been here once, when I first moved here two years ago. 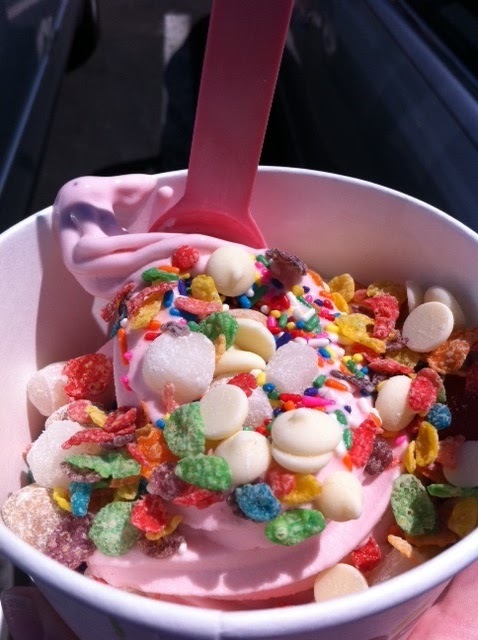 What do you think is proper fro yo etiquette?